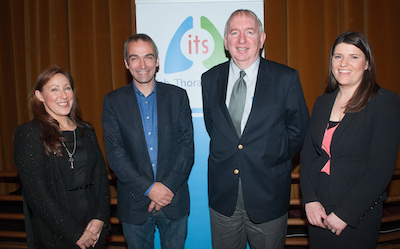 Professor Gerard McElvaney, RCSI, Beaumont Hospital is the recipient of the Irish Thoracic Society Research Grant 2013, awarded under the MRCG/HRB Joint Funding Scheme and supported by Boehringer Ingelheim Ireland and Novartis Ireland through unrestricted educational grants. The title of the research project is ‘Ignoring the Nonsense – Personalised Medicine for Genetic Lung Disorders. Professor McElvaney is pictured receiving the award from Dr Anthony O’Regan, President of the Irish Thoracic Society with Ms Michelle McLaughlin, Novartis Ireland and Ms Niamh Tuite, Boehringer Ingelheim Ireland.